NETWORK FINALS: The Christmas night SUNDAY NIGHT FOOTBALL adjusted to 6.4, down 1.7 from last week’s game. Elsewhere, BEAUTY & THE BEAST lost 0.1 in final numbers. CABLE HIGHLIGHTS: NFL Network had Sunday’s other game which, yes, was surreally aired as “Thursday Night Football.” Baltimore vs. Pittsburgh was by far the strongest programming on Christmas cable at 4.50. It was followed in the ratings by more sports, an NBA doubleheader on ESPN that had Boston vs. Knicks at 1.36 and Minnesota vs. Oklahoma City at 0.52. Hallmark’s movie WHEN CALLS THE HEART was at 0.51. There was more sports via a LIGA socver match on Univision at 0.49. 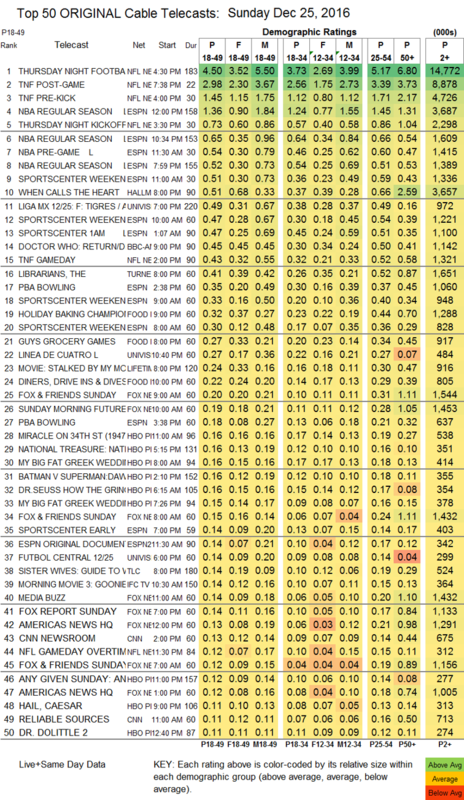 BBCAmerica’s DOCTOR WHO special was at 0.45, a massive number for that network. 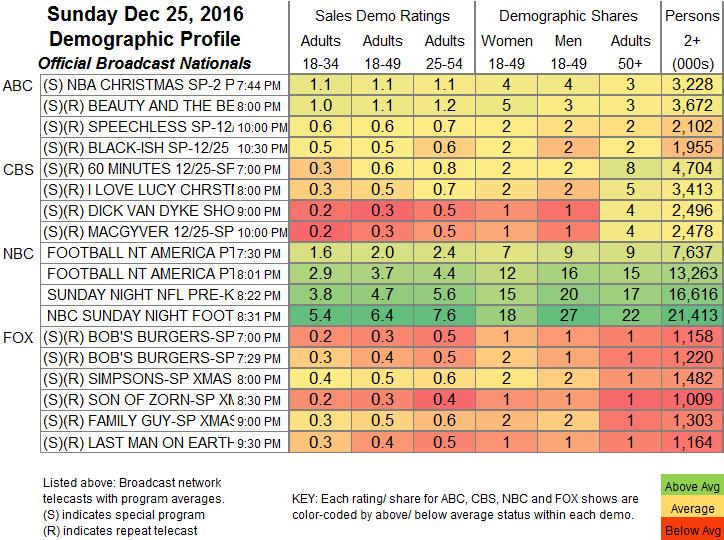 TNT’s THE LIBRARIANS, one of the few regular series to air a Christmas night episode, slipped 0.07 to 0.41. On Food Network, HOLIDAY BAKING CHAMPIONSHIP fell 0.18 to 0.32, GUY’S GROCERY GAMES was down 0.05 to 0.27, and DINERS, DRIVE-INS & DIVES was at 0.22.